Taylor local union head Linda Moore receives an award from AFT-MI president David Hecker and Secretary-Treasurer Lois Lofton Doniver. On Dec. 11, the Taylor School District closed because so many of its teachers skipped school to go to Lansing to protest right-to-work legislation. As a result, about 7,500 students in Taylor were forced to miss classes that day. 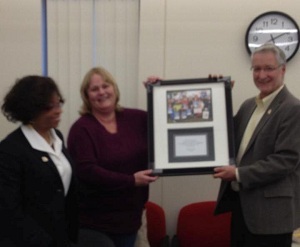 For organizing that "sick out" protest, the American Federation of Teachers-Michigan gave Taylor teachers' union president Linda Moore an award for "outstanding organizing." Public Act 112 in Michigan makes public school employees strikes and/or lockouts illegal. In a Jan. 28 announcement posted on Facebook, AFT Michigan boasted that so many union members took Dec. 11 off "that Taylor schools shut down." The photo (see nearby) shows AFT-Michigan President David Hecker and Secretary-Treasurer Lois Lofton Doniver with Moore during the presentation of the plaque. Hecker and Moore didn't return requests for comment. "I don’t think it is good thing to reward people for misbehavior," said Rose Bogaert, chairwoman of the Wayne County Taxpayers Association. "And I think it is misbehavior to abandon your students in the classroom for your own personal gain. They should have been in the classroom where they belong. For the union to heap praise on these individuals only tells me where their priorities lie." Bogaert said the Taylor teachers' union has shown a pattern of misdeeds. Not only did the teachers play hooky, she said, but the union also negotiated for and received a 10-year “security clause agreement” that skirted the state’s recently signed right-to-work law. That security clause agreement, which expires July 1, 2023, forces school employees to pay money to the union as a condition of employment. Taylor Public Schools became the first district to approve such contractual language when it was approved by the Taylor School Board and ratified by the Taylor Federation of Teachers AFT Local 1085 AFL-CIO members. Taylor was one of three public school districts to close because not enough employees showed up to work. Warren Consolidated Schools, which has schools in Macomb and Oakland County, and Fitzgerald Public Schools in Macomb County also were shut down. More than 26,000 students were forced to miss school when the teachers chose to protest instead of teach classes. As of 2011, the Taylor School District paid for the local union head to spend most of his time working exclusively on union business and not teaching in the classroom. Former local union head Wayne Woodford made $96,419 in total compensation to spend 75 percent of his time on union business while only 25 percent of his time teaching. Current local union president Linda Moore made $88,016 to spend half her time teaching and half her time on union business. The district has a $6 million deficit it is trying to eliminate. Taylor school district and union officials were invited by Rep. Tom McMillin, R-Rochester, to explain at a Tuesday hearing of the House Oversight Committee how the extended security clause benefits students, but they chose not to attend. They sent written information instead, but that didn't answer questions, Rep. McMillin said in a statement. “I can't understand why they are scared to come explain it to us since, apparently, they believe it's a great deal," Rep. McMillin's statement said. "Unless, maybe it's not so great after all. I've never heard of any school having a 10-year contract with teachers."